The much-maligned Brussels sprouts can be made into dishes that will win over almost everyone. The key is to roast them, bringing out their sweetness by caramelizing and tenderizing them. Their rich, nutty flavor can then come out. This unusual recipe combines the roasting with a delicious twist – a Maple-Dijon dressing that really sets these humble brassicas apart! 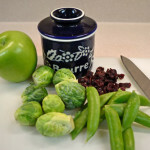 Here’s what could come out of your garden for this recipe – Brussels Sprouts! Pan-roasting Brussels sprouts sweetens and tenderizes them, and adding this unique and highly tasty maple-Dijon dressing really kicks this dish up a notch. 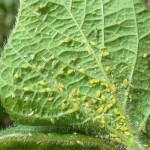 This works extremely well with oven roasted chicken or turkey as a side dish. Whisk together all ingredients in a small bowl and refrigerate for an hour to let flavors mingle. 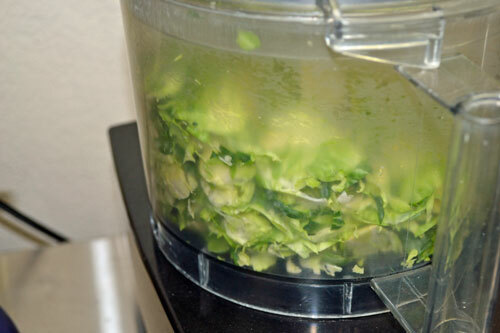 Use a food processor with a 2mm or 1/16 inch slicing blade to slice all the Brussels sprouts, set aside. Heat a large heavy (cast iron is preferable) skillet over low to medium heat and roast Brussels sprouts in butter with the salt until they soften and just start to caramelize, about 15 minutes. Stir often to prevent sticking. Increase heat to medium, add apples and dried cranberries. saute until apples are tender, about 5 - 10 minutes. 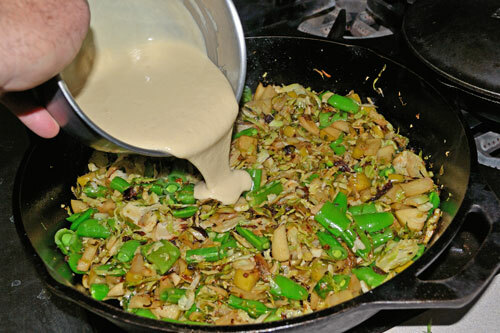 When apples are tender and Brussels sprouts have caramelized, remove from heat and stir maple-Dijon dressing in. You can use other cool season veggies to add a different note to this dish. We had some left-over sugar snap peas that we added for a sweet crunch! … to this – ready for the pan! 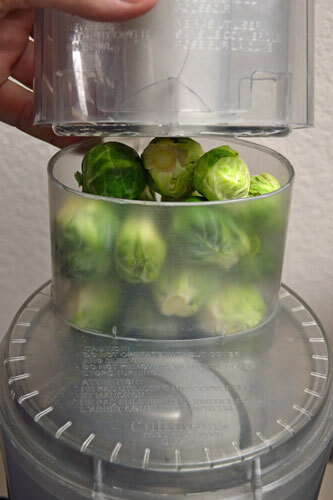 Slicing the Brussels sprouts made them much easier and faster to roast. 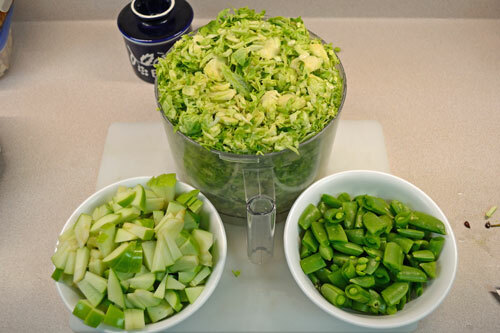 From there it was short work to dice the apples and chop the sugar snow peas. We added them because they were handy and weren’t tagged for another recipe. 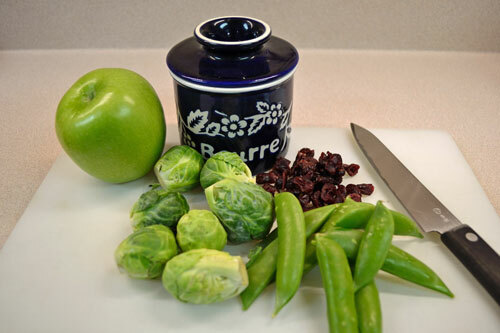 Once the Brussels sprouts had roasted for a few minutes and started to caramelize, the apples and peas were added. 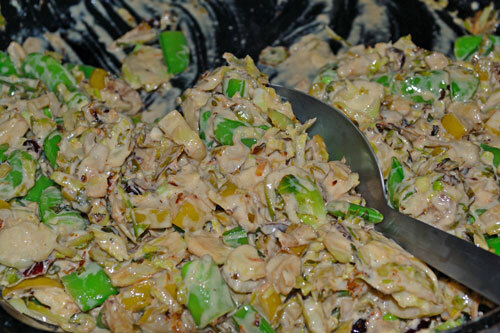 A few minutes later, the dressing was added and stirred in. Ready to serve! 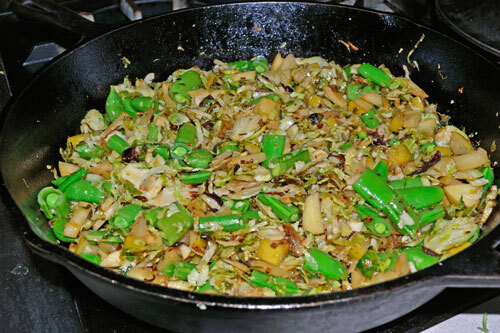 The combination of flavors – rich and nutty from the sprouts to the sweet and light of the apples and peas, to the sweet/savory of the maple and mustard – all worked really well together. 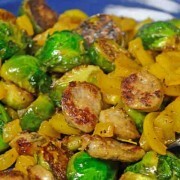 Your roasted Brussels sprouts with maple-Dijon dressing – in a word scrumptious! It’s our new favorite way to eat them. So glad to hear! Thanks for letting us know.